Cellulite is caused by fat deposits that sit side-by-side with tough collagen fibers that are anchored to the muscle beneath. When the fibers pull tight, or the fatty areas grow larger, the fat deposits may bulge out. Cellulite gives a dimpled or lumpy look to the skin, usually on the thighs, abdomen, or buttocks region. 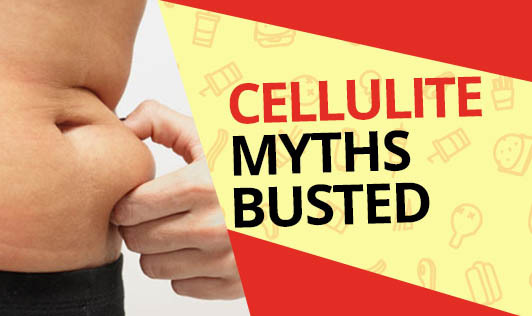 Let's look into popular myths associated with cellulite. Myth: Skinny people don't have cellulite. Fact: Cellulite is related to the structures within the skin, so even thin men and women are likely to have some cellulite. And if thin skin runs in your family, the cellulite you have will be more visible. Myth: Tanning can hide cellulite. Fact: Tanning may make the cellulite less obvious, but when the tan fades, the cellulite might look even worse. That's because frequent exposure to UV rays can damage the skin, making it thinner and less resilient, according to the International Academy of Cosmetic Dermatology. Myth: Cellulite can be cured by making lifestyle changes, and through beauty treatments and cosmetic procedures. Fact: You may be able to minimize your cellulite through lifestyle changes and even products or procedures, but beware of promises to "rid" you of cellulite. Most treatments and procedures like liposuction use laser devices, which at best can improve the appearance of cellulite, while you use them. Myth: If you drink an excessive amount of water you will be able to reduce your cellulite. Fact: This myth has been around since the term cellulite first became popular. Unfortunately, water intake has nothing to do with decreasing cellulite, so drinking lots of water will not make any difference at all. Myth: Dieting and exercise can eliminate cellulite. Fact: Cellulite is the trapped fat that lies beneath the skin. Unfortunately, dieting and exercising will not get rid of cellulite. But, eating healthy and working out regularly can improve the appearance of cellulite and is important for your overall health and well-being. Thus, those who want to lose cellulite need to lower their total body fat percentage.